Murder, a point-and-click cyberpunk adventure, looks like much fun, coming on Oct 21. I'm not usually much taken by "16 bit" style graphics, but if you check out the trailer, perhaps you'll agree - this looks like its style goes beyond its retro appearance. It'll be available for OS X, Linux, Windows, iPad, and Android tablets. Thursday saw me go underground, where few have seen - beneath Clapham, to be exact. "The one likely to cause the most excitement, is the exceptionally rare opportunity to go into the Clapham South deep level shelter, a series of tube tunnels dug next to the tube station that were used as accommodation during air raids. After the war, the tunnels were used to house arrivals from Empire Windrush before being transformed into Bed & Breakfast accommodation for the Festival of Britain. One of eight such shelters across London, most are off limits as they are used for secure document storage, so this is a very rare opportunity." Unfortunately, I didn't really wind up with many great photos, as - as you'd expect - it mostly consisted of long tunnels, with long, long avenues of bunk beds. Still, I suppose even that's worth sharing? It wasn't exactly luxurious accommodation, but it was safe, some 80m below ground. During World War II, priority was extended to those who'd been bombed out, and given permanent passes. Another distinct bonus - and something occupants made quite a point of highlighting - was that food rationing was suspended in the canteens. True, prices were much higher than outside - up to double - but the availability of treats like jam tarts was something much prized. I'll post this entry without photos, for now, and instead, post some in the coming days - I'd rather not hold up posting the entry, and I know I can get very fussy about photo processing. A rather amusing seven minute animated short y'might enjoy: The Saga of Biorn, telling the tale of an old Viking warrior seeking a glorious ending in combat. There's a new Who spinoff coming in 2016: Class, on BBC 3, "a new 8 x 45 minute Doctor Who spin off from the acclaimed YA author, Patrick Ness. Class is a YA series set in contemporary London. Incredible dangers are breaking through the walls of time and space, and with darkness coming, London is unprotected. With all the action, heart and adrenalin of the best YA fiction (Buffy the Vampire Slayer, The Hunger Games), this is Coal Hill School and Doctor Who like you’ve never seen them before." Interesting to see it'll all be written by a single author, rather than a team, each member helming an episode or two. 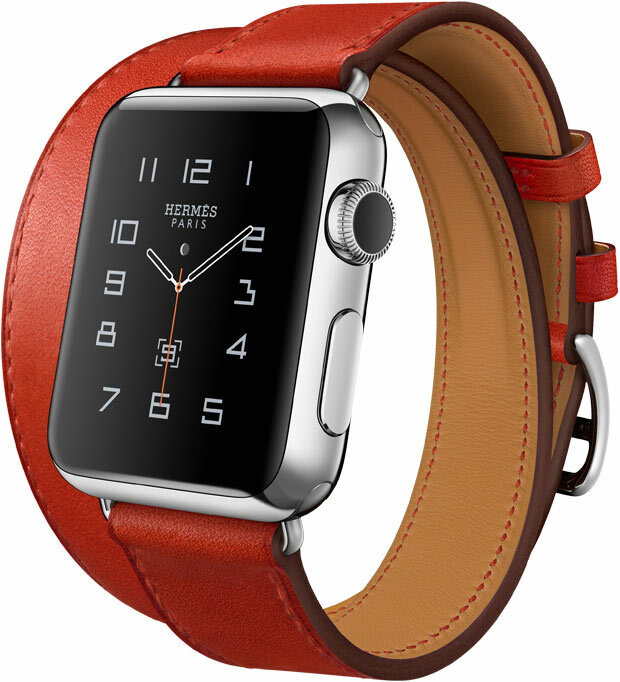 It remains to be seen when I might actually be able to contemplate such a purchase, but I will admit, the Hermès Apple Watch with the Double Tour band has quite caught my eye - just so elegant! And in the capucine hue.. ah, it makes me happy. I adore such excellence in design. I sort of wish I'd made a time lapse of my nails' recovery under terbinafine, though it probably would've looked rather macabre. =:) The hands are approaching "normality" (not a word you'll find often here), but the feet still have a couple months more ahead. Compo of the week: trip for two to Hong Kong or Kuala Lumpur for two people, plus stopover in Dubai, with 1,000€ credit to spend in the Michael Kors store in Dubai, flying in business class, hotels included. Open to residents of the UK, France, Spain, and Hungary. Nail infections take a long time to treat! My son is on terbinafine for Tinea versicolor</i>, which hopefully will be resolved in a week. Clapham sounds neat, I'd like to visit that. I did enjoy it, definitely. There felt like so much hope - all so monotonous, yet, safe, though the shelters didn't really come into their own until after that abominable insanity (I had family members on both sides). I like to feel they represented the resilience of humanity. I'll probably have to post some other photos. I'm not sure those will be accepted in as neutral a manner, but I'll try. The pork puree sounds interesting. You ever use Worchestershire Sauce in dishes? I'm quite fond of it in almost anything including chili and meatloaf. I actually haven't had Worcestershire Sauce around in a while! I should do, though - it's fabulously flexible stuff. True, you can make up for it in many ways, especially balsamic vinegar (oh, such a delight! ), but it's so handy to have that nifty tang at hand. I use fish sauce regularly for soups and stews and balsamic wherever possible. I have probably a half dozen different flavored balsamics, I use a combination of two when I make carrot salad, which I haven't made in quite a while. Last Wednesday I made spaghetti carbonara with peas. It was WONDERUFL. My wife likes nutmeg with her pasta, I think we slightly overdid it but it's still fine. Ah, found my carrot salad recipe! I use Hojiblanca olive oil, cranberry pear white balsamic, peach white balsamic, and golden raisons. Add shredded carrots, and that's the entire recipe. That Dr Who spin off sounds interesting.